Make you one Flipdoo Book in a few Minutes! PDF to Flash Page Flip as server side converting solution? Flipdoo Publisher v1.4 is here! Flipdoo allows you to build stunning flash flip books for both online and offline use in minutes. You don't need any additional software. Import your PDFs, configure book look & feel and publish. This is the best way to create digital ( electronic ) editions such as any type of publications, magazines, brochures and catalogues. 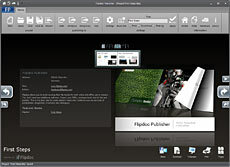 Flipdoo Publisher is a Windows desktop application that helps you to produce remarkable online and offline digital editions, magazines, brochures with page turning effect. No coding is required. Simply import your PDF, configure the look & feel and hit the publish button. Enjoy the real page turning effect. The system requirements for your site are minimal. You do not need PHP, ASP, SQL or any other server applications to be installed. You do not need programming skills. The installation procedure is just file copying on the server. The system requirements to your site are minimal. You do not need PHP, ASP, SQL or any other server applications to be installed. You do not need programming skills. The installation procedure is just a files copying on the server.